Socialism without public ownership is nothing but a fantastic apology. Michael Mackintosh Foot (23 July 1913 – 3 March 2010) was a British politician, son of the politician Isaac Foot. He was leader of the Labour Party from 1980 to 1983. Is the Labour Party to remain a democratic party in which the right of free criticism and free debate is not merely tolerated but encouraged? Or are the rank and file of the party to be bludgeoned or cowed into an uncritical subservience towards the leadership? The only man I knew who could make a curse sound like a caress. The members of our secret service have apparently spent so much time under the bed looking for communists that they haven't had the time to look in the bed. When I was a small boy, following the affairs of the House of Commons as closely as I could, I asked my father what a Royal Commission was. He said, "It is a broody hen sitting on a china egg". I have respect for the history of this House. There is nothing reprehensible in people recalling that some of the liberties of the people of this country enshrined in this House go back not merely to the conflicts of the seventeenth century, which will certainly apply to many of the matters with which we have to deal—the power over taxation which resides, or is still to reside, in this House—but to the controversies which prevailed in the House of Commons during the reign of Queen Elizabeth I. If people say to me that all these are remote, old-fashioned ideas, I reply that they are as up-to-date as the ideas that brought the Labour Party into being. …no one can dispute the proposition that the Bill is the most deliberate proposal for curtailing the powers of this House that has ever been put before Members of Parliament. If the Government say they are going to ram through this measure to reduce the power of the Commons it would be scandalous. It is one of the most shameful frauds ever perpetrated. It would break the control between government and the people and this would inflict serious injury on our democratic institutions. If they do that we will be nearer the day when people will say 'All right, let us settle things by violence'. If the Common Market Bill goes through, Parliament will have been deprived of some of the essential instruments for planning the nation's economy. The issue of sovereignty...was always intertwined with the issue of democracy. Many of us held that it was not only unwise but wanton for British MPs to surrender a part of our democracy to institutions which were so grotesquely undemocratic. What I do seek to do is contest the suggestion that the present arguments in the Labour Party can be categorized as those between Social Democrats and Marxists. This strikes me as misleading and indeed politically illiterate, since, historically speaking, many Social Democrats have regarded themselves as Marxists. Moreover, the idea implicit in this false distinction that Marxism is somehow inherently undemocratic or anti-democratic is a perversion of thought and language comparable with that perpetrated by the Stalinists. May I add that those engaged in destroying British Parliamentary democracy by the acceptance of the European Communities Act in all its immeasurable undemocratic manifestations are in no position to "lecture" others about how to preserve British democracy? Some fool or some trigger happy judicial finger. In the Labour movement they said they would have no truck with coalition, but if Britain stayed in the EEC then for decades to come they would be enmeshed in various forms of coalition government than ever before. That was the most important issue of all. If in Britain the people did not like a government they could vote it out of office, but they had no similar recourse in the case of the institutions of the EEC, which had supreme powers and which were undemocratic. They had been told that those political disabilities, the delegations from our sovereignty and the dismemberment of Britain's parliamentary institutions, must be accepted because of economic circumstances; that there was no choice. But [I] did not believe that. I hope the message which will go out from this conference to our movement up and down the country is, 'Do not let this great Labour movement be afraid of those who tell us that we cannot run our own affairs, that we have not the ingenuity to mobilize our resources and overcome our economic problems'. Of course we have, and we can save our democratic freedom at the same time. Speech to the Union of Post Office Workers at Bournemouth (15 May 1977). He's passed from rising hope to elder statesman without any intervening period whatsoever. Since the matter has been raised, may I say that the individual concerned is not an endorsed member of the Labour Party, and, so far as I am concerned, never will be endorsed? [Interruption.] May I add that, as the Labour Party has played the leading part in the establishment and sustenance of parliamentary democracy, we do not need any instructions on the matter from skin-deep democrats on the Conservative Benches or defectors on this side? Remark in the House of Commons (3 December 1981), referring to Peter Tatchell. Foot subsequently corrected "endorsed member" to "endorsed candidate". The rights and the circumstances of the people in the Falkland Islands must be uppermost in our minds. There is no question in the Falkland Islands of any colonial dependence or anything of the sort. It is a question of people who wish to be associated with this country and who have built their whole lives on the basis of association with this country. We have a moral duty, a political duty and every other kind of duty to ensure that that is sustained. The people of the Falkland Islands have the absolute right to look to us at this moment of their desperate plight, just as they have looked to us over the past 150 years. They are faced with an act of naked, unqualified aggression, carried out in the most shameful and disreputable circumstances. Any guarantee from this invading force is utterly worthless—as worthless as any of the guarantees that are given by this same Argentine junta to its own people. Speech in the House of Commons (3 April 1982) after Argentina's invasion of the Falkland Islands. We are paramountly concerned, like, I am sure, the bulk of the House—I am sure that the country is also concerned—about what we can do to protect those who rightly and naturally look to us for protection. So far, they have been betrayed. The responsibility for the betrayal rests with the Government. The Government must now prove by deeds—they will never be able to do it by words—that they are not responsible for the betrayal and cannot be faced with that charge. That is the charge, I believe, that lies against them. Even though the position and the circumstances of the people who live in the Falkland Islands are uppermost in our minds—it would be outrageous if that were not the case—there is the longer-term interest to ensure that foul and brutal aggression does not succeed in our world. If it does, there will be a danger not merely to the Falkland Islands, but to people all over this dangerous planet. Speech before the 1983 General Election. explaining Labour's 1983 election defeat when he was leader in his book Another Heart And Other Pulses, 1984. It is all the more necessary that we should prevent an extension of the powers of the European Assembly, however it may be elected. I have been opposed to the extension of those powers, and I remain so. ... We must preserve every precious part of the power that we retain in the House. The right hon. Member for Heseltine—[Laughter. ]—well, that is what he is; he sticks to that principle more than he does to Henley. Speech in the House of Commons (26 March 1991), referring to Michael Heseltine. MPs are referred to in the House by the constituency they represent rather than by their name, so Mr Heseltine would be "Rt. Hon. Member for Henley". Whether by accident or intent, Foot mixed this up in a way which clearly amused other MPs. No rising hope on the political scene who offered his services to Labour when I happened to be its leader can be dismissed as an opportunist. On his departure from the House of Commons, 1992. 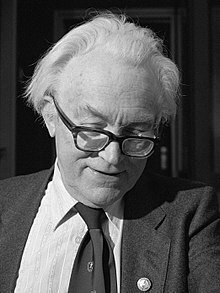 Farewell Michael Foot: Great orator, editor and thinker - the most decent leader Labour ever had. Foot's ultimate task, as orator, pamphleteer, and communicator extraordinary, has been to educate, and to relate the British variant of socialism to a long, but still relevant, history of British libertarian protest—in other words, to the real world. In his respect for parliament, for the rule of law (subject to some very valid doubts about the judgement of judges), for representative democracy, for the pluralism and tolerance embedded in the culture of his people, he has been in the best sense a force for stability. … He has re-articulated and vindicated a long, creative legacy of protest which in the 1970s seemed close to being corrupted or destroyed. Michael Foot is a master of English. Both in parliamentary debate and in the written word his diction has the qualities of purity and terseness which the Augustans admired and sought. Indeed, it is of the age of Dryden and Pope, Addison and Swift, where he personally feels most at home, that he is the foremost modern heir and representative. His writing, like his speaking, is almost invariably perspicuous and graceful, offering no avoidable impediment to the reader, and concealing its imaginative quality with the artist's art. … Foot's Bevan will be among the outstanding biographies of the twentieth century. This page was last edited on 22 December 2018, at 23:43.